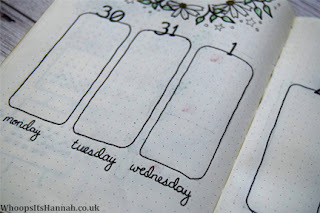 I've been bullet journalling for over a year now, and I thought it was about time that I shared my monthly spreads with my readers here on Whoops It's Hannah. 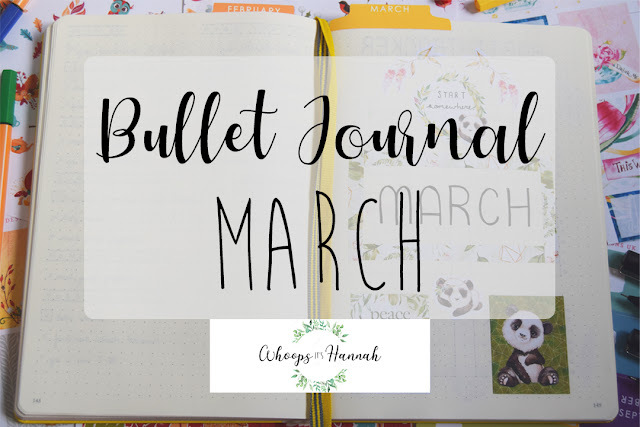 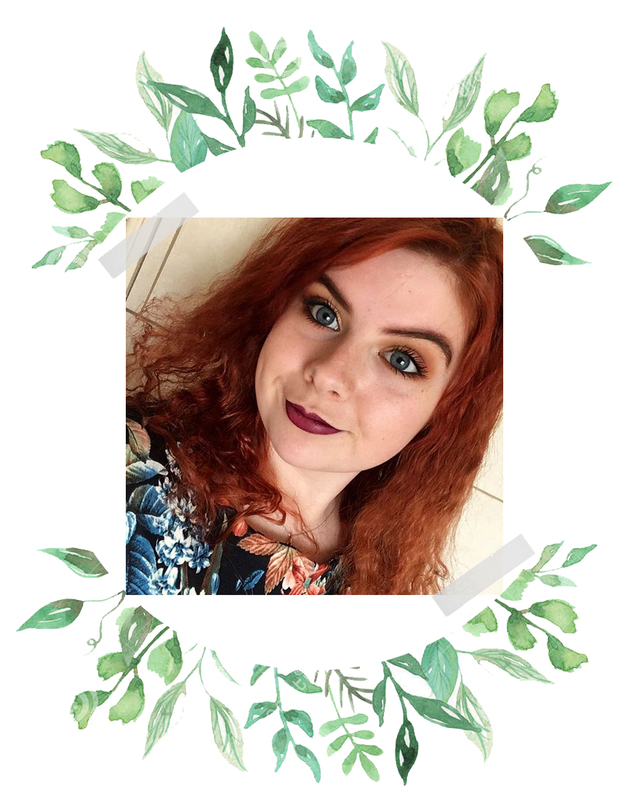 This month was 100% inspired by @My.Life.In.A.Bullet on Instagram on YouTube, so I really recommend you take a look at her pages as well. 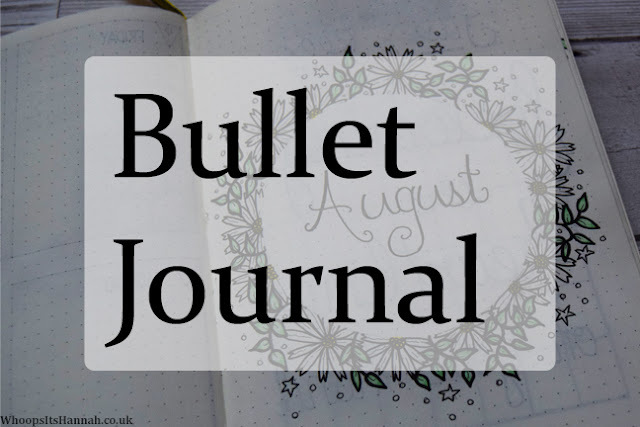 This is the title page. 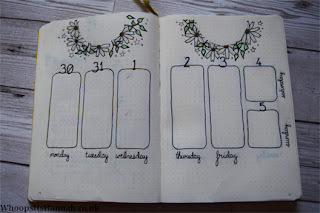 I loved the look of Cristina's wreaths where she didn't outline the circle and just surrounded it with flowers to give it the shape. 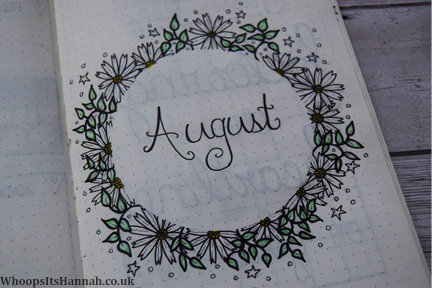 I also love doing typography and hand lettering so I took my time writing the month and I think it paid off! 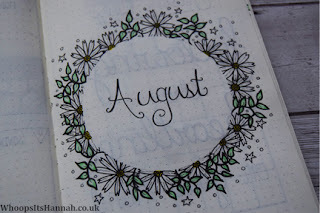 I drew the daisies following her tutorial in this video, and I love the texture of drawing circles in the centre. 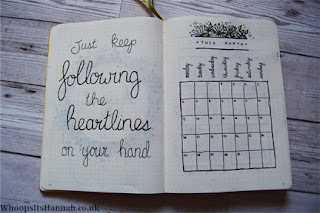 For the first double page of the month, I decided to write this quote from the song 'Heartlines' by Florence and the Machine. 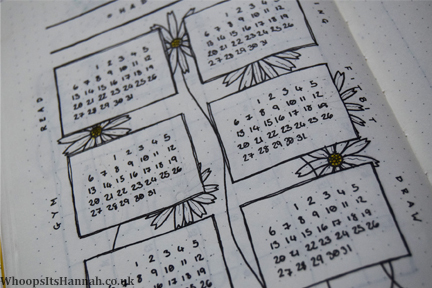 It's one that I really love, and to be honest I just needed something to fill that page! 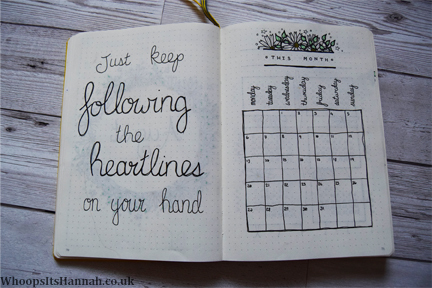 On the other page is a calendar of the month, where I intend to write down important dates and things like that. 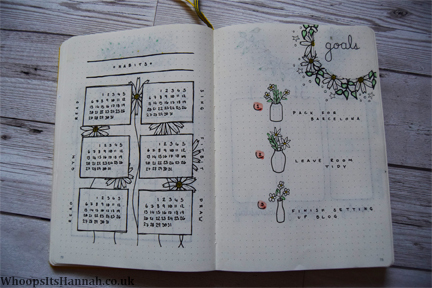 Over the page, I did my habit tracker and set myself three ambiguous goals for the month. They're just things to bear in mind through the month rather than tick off meticulously. 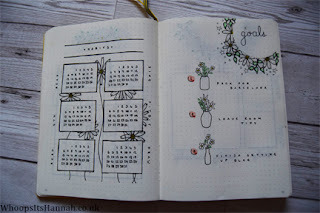 The goals page was completely copied from My Life in a Bullet, although I of course set my own goals. 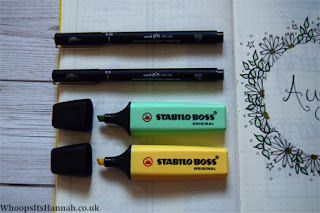 They are to pack for Spain (I move there in September! 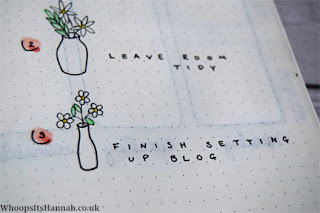 ), leave my room tidy, and finish setting up my blog. 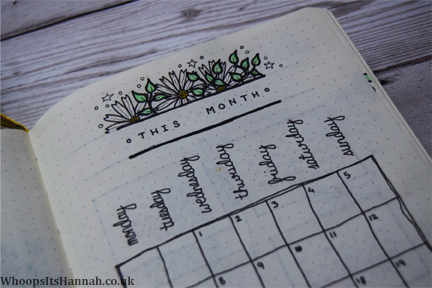 The habits I want to track this month are wearing my FitBit, going to the gym, singing, practising monologues, drawing something, and reading something. 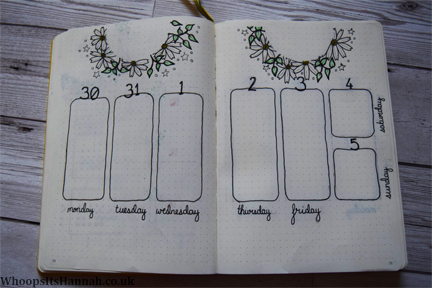 This is a look at my weekly layouts for the month. I normally give myself as much space as possible, but then I never fill it, so I thought I'd give myself more empty space at the top and bottoms and leave more reasonably sized boxes instead. 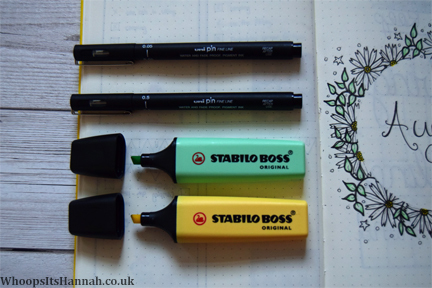 I may use the space at the bottom for doodles so I can tick off my 'draw something' habit! 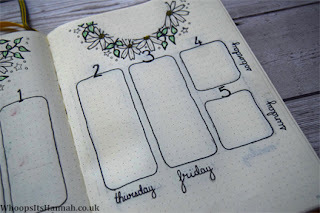 I'm always scouring Instagram from layout ideas, so I'm afraid I don't remember where I got this layout from, although I'm pretty sure many bullet journallers do similar ones! Let me know if there are any bullet journalling accounts you think I'd enjoy!